The existence of extraordinary feats of engineering found in some of the ancient sites around the world, often showing similarities of style and technique, must, or should anyway, call into question the version of history we are presented with. Ouspensky also thought that most of Earth history had been written quite recently, within the last 300 years or so. In order to understand the substance of the idea of esotericism it must first be realised that the history of humanity is much longer than is usually supposed. But it should be observed that the usual view of textbooks and popular "outlines of history", which contain a very short historical period and a more or less dark age before that, is in reality very far from the most recent scientific views. Present-day historical science is beginning to regard the "prehistoric" period and the "stone age" quite differently from the way in which they were regarded fifty or sixty years ago. It cannot regard the prehistoric period as the period of barbarism, because against this view there speaks the study of the remains of prehistoric buildings and extant memorials of prehistoric art and literature, the study of the religious customs and rites of different peoples, the comparative study of religions, and particularly the study of language, that is, the data of comparative philology, which show the astonishing psychological richness of old languages. On the contrary, in opposition to the old view, there already exist many theories and there appear many new theories on the possibility of ancient prehistoric civilisations. Thus the "stone age" is regarded with more probability as a period not of beginning, but of the fall and degeneration of previously existing civilisations. In this respect it is very characteristic that all present-day "savages" without exception, that is to say, peoples whom our culture has found in a savage or semi-savage state, are degenerate descendants of more cultured peoples. This most interesting fact is usually passed over in silence. But not a single savage race that we know of, i.e., no isolated savage or semi-savage people met so far by our culture, has shown any sign of evolution in process in any respect whatever. On the contrary, in every case without exception, signs of degeneration have been observed. I do not speak of degeneration consequent upon contact with our culture, but of degeneration which has been in process for centuries before contact with our culture, and is in many cases perfectly clear and evident. All savage or semi-savage peoples have tales and traditions of a golden age, of a heroic period; but in reality these tales and traditions speak of their own past, of their own ancient civilisation. The language of all peoples contains words and ideas for which there is no longer any room in their actual life. All peoples had in their past better weapons, better boats, better towns, and higher forms of religion. The same fact explains the superiority of the Palaeolithic, that is, more ancient drawings found in caves, to the Neolithic, that is, more recent drawings. This also is a fact that is usually passed over altogether or left without explanation. From: Esotericism and modern though, P D Ouspensky. The existence of the remains of so many man(?) made, large and extensive underground facilities makes me wonder if they were constructed with the knowledge that catastrophic events were known to occur periodically, or perhaps that such an event was known to be approaching. The facilities were an attempt to save the lives of as many people as possible, not from wild animals or marauding enemies, but from natural disasters of gigantic proportion. I hope sites such as the tunnels under the Bosnian pyramids are explored further, and wonder if the unexplored side tunnels, often bricked op, would find the remains of humans who had done everything possible to survive, even to sealing up the exits to their hideouts, as plasma from a large electrical event would flow like water into caves and tunnels and anywhere it could. It would seem that there were survivors, now deprived of all the greatness of the Golden Age, forced to begin rebuilding without benefit of the advanced science and technology of the previous age. This possibly mad idea would seem to explain why so many of these ancient sites are out of bounds for extensive exploration, why the Smithsonian seems to have hidden away so much evidence, and why there still seems to be an active program of destruction of what remains. When the invading USA armed forces moved into Babylon I was shocked at the destruction they caused, but maybe they were after something much more important than we might ever know about? Read this online book and pick your own flavor of 'Puzzles' For The Mind. think of the magnitude of power that was given off. stream science is way way off on this one. that we might rebel or riot to escape the truth. Although we have some pretty good examples of rivers of stone in my area, the stones were brought by the glaciers I am told. 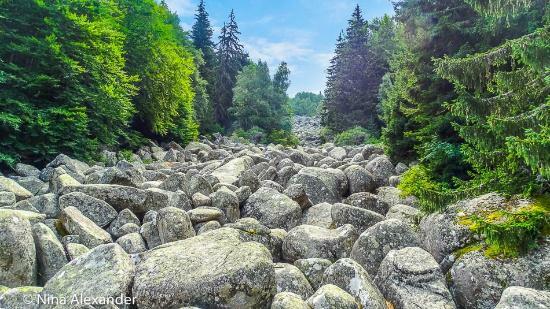 Looking at these images from Vitosha Mountain in Bulgaria though, I wonder why some of the rivers of rock have rounded boulders, others less rounded, and others very jagged? Do glaciers sort them by size and shape? Bulgaria has some other interesting rock formations, including a pothole on a ridge, not in a river bed. Mystery Rocks Near Fort Walsh in the Cypress Hills Interprovincial Park, Canada. Magalithic stonework, or EM forces? Definitely not glaciers! Although this site suggests that the lines of stones found in many parts of the USA were built perhaps by ancient, unknown peoples, or even Gods, I suspect they are from EM forces. It seems unreasonable to believe glaciers or floods could pile up lines of rock as they are found, and although some may appear to have been purposely stacked, and might have been, many have very large stones and the stacking very messy. But the processes involved if they are the result of EM forces would also be a puzzle. I mean really, what are the odds of glaciers leaving big boulders in such precarious locations? 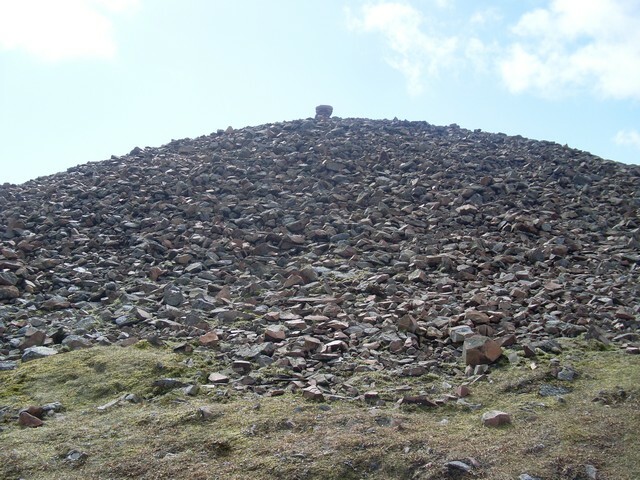 Lots of hills in Scotland have 'cairns' on the top, where hill walkers deposit a stone onto the pile as a memento of their climb. The piles are usually around a meter high and a meter wide, but this one is huge. It is also thought to have been there for at least 1000 years, no-one is really sure of its history. Either some ancient Druidic society carried it all up there or it is a natural formation. And in the Lake District too, where I used to hike. The image certainly seems to me to show a natural origin, if you think huge lightning strikes natural. As perpetual motion said above "It is just mind boggling to think of the magnitude of power that was given off. ", but really, that hill was relatively small compared to many other events. There are peaks around where I now live that are very similar, though none as large as yours that I have come across so far. Perhaps the cairns at many locations were inspired by the natural ones? A search 'Summit cairn, Tinto Hill geology' found a link to google books, Transactions of the Geological Society of Glasgow, and some interesting conclusions about the geomorphology of the area, but its all electrical in nature to me, forget the glaciers I say. In New Mexico, near Deming, there is the City of Rocks. A compact area of very large rocks in the state park exists in a landscape otherwise devoid of any surface rocks. They are said to have been deposited by a volcano many miles away. I suggest they were removed from the hill in the background of the photo in the link provided above. The hill formation looks like a good example of an electrical discharge event which removed material and dropped the rocks in close proximity to the hill. I would have provided photo's if my computer skills were better. If you google/satellite the site the hill is off to the north east a few hundred yards. Ps. I have looked around the area more thoroughly via Google. There are smaller areas of rock that lead to the hill. There is exposed rock all around the perimeter of the hill, and there is another smaller area of rock on the other side of the hill from the City of Rocks side. The evidence for an electric event very local to the hill is strong, while the "official" explanation of the rocks coming from a volcano 10/15 miles away makes little sense. Hi jackmac, I think it also must be considered that the rocks did not come from anywhere, they could be created right where they are now found. 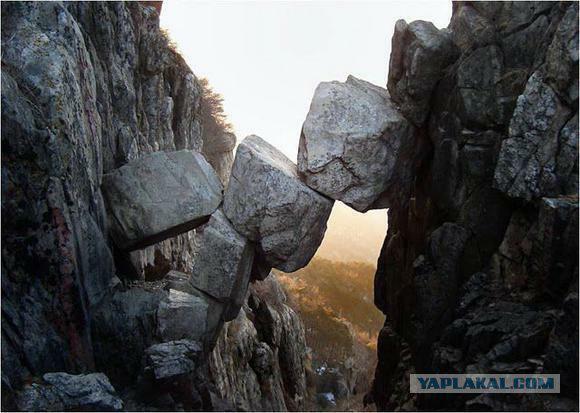 This image suggests a sustained discharge and altering of the rock properties, but material can be removed or deposited electrically, and in short time periods. If the Native American legends tell of mountains being created and being dissolved in the space of a day, then I don't see why formations like the City of Rocks couldn't have been done perhaps in minutes. I was just looking at White Pocket, Vermilion Cliffs National Monument, Arizona. The geologists struggle with the processes involved here, but again, this could be just a few minutes work for the magnitude and diversity of EM forces we must consider. GaryN wrote: Hi jackmac, I think it also must be considered that the rocks did not come from anywhere, they could be created right where they are now found. This image suggests a sustained discharge and altering of the rock properties, but material can be removed or deposited electrically, and in short time periods. I think we need to seriously consider the possibility that some of the unusual formations may have indeed grown in that location, perhaps rapidly precipitating out of solution due to a focused high energy discharge. Such a proposal, of course, would be devastating to current mainstream geology. 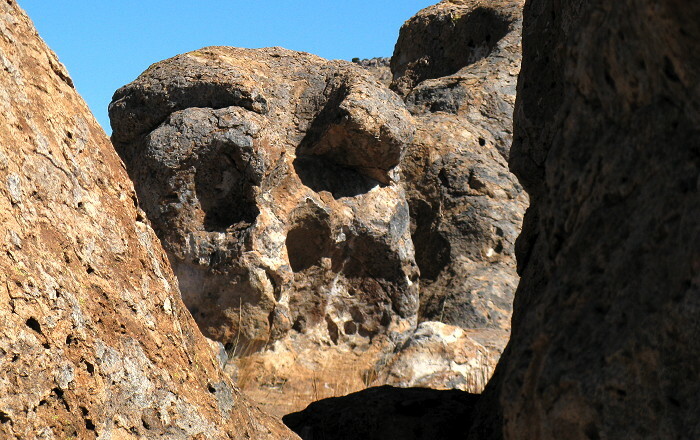 By the way, am I the only one who thinks that rock looks like Darth Vader's skull? Hi jackmac, I think it also must be considered that the rocks did not come from anywhere, they could be created right where they are now found. When I first visited the City of Rocks it seemed obvious that the rocks came from the nearby hill without a top and an excavated center. Later, I read an analysis of the rock(I have lost the link) and they discussed evidence of very high temperature changes in the rock. So, to be more specific, I say the material came from the hill, raised up by an electric discharge, became molten, and was then dropped nearby where the solidifying probably took place. So, I partially agree with you that the rock forms were created where they are; but I still say the material came from the hill. Certainly they did not come from a volcano ten miles away, as is suggested by the gravity only people. Definitely suggestive of a skull. In my area there are little rocky ridges, a bit similar to the cairn above, but long. Around 10 meters high, and a few hundred meters long. They look like deposits to me. or if an electrical discharge ran along the surface while depositing. When I first visited the City of Rocks it seemed obvious that the rocks came from the nearby hill without a top and an excavated center. Yes, I believe the diversity of EM effects is very great, but it would likely be possible to figure them all out eventually. 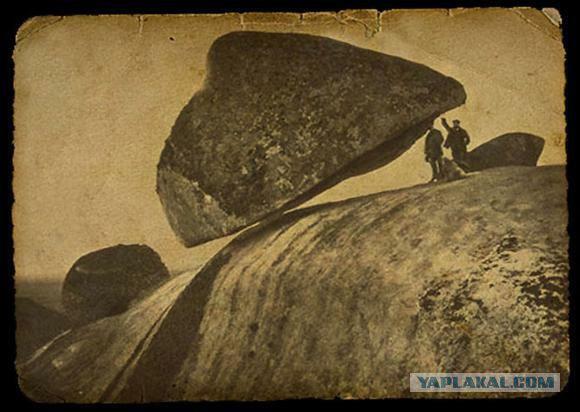 In the case of the City of Rocks, I don't think the rocks would have been removed as rocks from the nearby hill, but would have been turned to dust, and grown again at their present location. Discharges or plasma flows do not all have to come from above, as long is there is sufficient potential difference between two regions on the surface, a dusty plasma tube could form. The role of strong underground currents and localised charges is not known, we can only imagine, which I do a lot of! In no way am I arguing with your interpretation, perhaps a scientific investigation would turn up a different explanation altogether! I'm glad they didn't see it on the Martian surface. Where are you? Be interesting to see if there are any lava flows mentioned, and to look at the terrain on Google maps for any electrical looking features. Gorgeous day here today, think Ill head to the seashore and do some magnetic anomaly hunting. At Otter Point, a few miles north of Sooke, the evidence for EM forces at work is undeniable. Photos can not do it justice, but close inspection reveals the truth, though Geologists can never accept it. Pebbles, cobbles and boulders are found in jagged cracks that run up the bedrock, and are immovable, formed where they are found. Erosion of the surface, sometimes into pits or 3d sculpted ridges is evident. The rock itself has been glassified in places, and the whole outcrop is extremely hard. Even at sea level there is no sign of any smoothing or undercutting by water/wave action. I have put the images in a Flickr album, not sorted or commented yet.